An elliptical arc. Because it performs various optimizations, it can not be filled. The arc must be used in an Axes instance—it can not be added directly to a Figure—because it is optimized to only render the segments that are inside the axes bounding box with high resolution. If theta1 and theta2 are not provided, the arc will form a complete ellipse. Lancaster, Don. Approximating a Circle or an Ellipse Using Four Bezier Cubic Splines. There is a use case where very large ellipses must be drawn with very high accuracy, and it is too expensive to render the entire ellipse with enough segments (either splines or line segments). Therefore, in the case where either radius of the ellipse is large enough that the error of the spline approximation will be visible (greater than one pixel offset from the ideal), a different technique is used. The points where the ellipse intersects the axes bounding box are located. (This is done be performing an inverse transformation on the axes bbox such that it is relative to the unit circle – this makes the intersection calculation much easier than doing rotated ellipse intersection directly). Vince, John. Geometry for Computer Graphics: Formulae, Examples & Proofs. London: Springer-Verlag, 2005. The angles of each of the intersection points are calculated. Proceeding counterclockwise starting in the positive x-direction, each of the visible arc-segments between the pairs of vertices are drawn using the bezier arc approximation technique implemented in matplotlib.path.Path.arc(). Draws an arrow, starting at (x, y), direction and length given by (dx, dy) the width of the arrow is scaled by width. ArrowStyle is a container class which defines several arrowstyle classes, which is used to create an arrow path along a given path. These are mainly used with FancyArrowPatch. and it returns a tuple of a Path instance and a boolean value. path is a Path instance along witch the arrow will be drawn. mutation_size and aspect_ratio has a same meaning as in BoxStyle. linewidth is a line width to be stroked. This is meant to be used to correct the location of the head so that it does not overshoot the destination point, but not all classes support it. An arrow with a bar(|) at both ends. An arrow with a bracket(]) at its end. An arrow with a bracket(]) at both ends. An arrow with a bracket([) at its end. A simple curve without any arrow head. An arrow with a head at its begin point. An arrow with heads both at the begin and the end point. An arrow with a head at its end point. An arrow with filled triangle head at the begin. An arrow with filled triangle heads both at the begin and the end point. An arrow with filled triangle head at the end. A fancy arrow. Only works with a quadratic bezier curve. A simple arrow. Only works with a quadratic bezier curve. Wedge(?) shape. Only wokrs with a quadratic bezier curve. The begin point has a width of the tail_width and the end point has a width of 0. At the middle, the width is shrink_factor*tail_width. BoxStyle is a container class which defines several boxstyle classes, which are used for FancyBoxPatch. Following boxstyle classes are defined. and returns a Path instance. x0, y0, width and height specify the location and size of the box to be drawn. mutation_scale determines the overall size of the mutation (by which I mean the transformation of the rectangle to the fancy box). mutation_aspect determines the aspect-ratio of the mutation. The amount of padding around the original box. A box with round corners. Another box with round edges. Create true circle at center xy = (x, y) with given radius. Unlike CirclePolygon which is a polygonal approximation, this uses Bézier splines and is much closer to a scale-free circle. A polygon-approximation of a circle patch. Create a circle at xy = (x, y) with given radius. This circle is approximated by a regular polygon with resolution sides. For a smoother circle drawn with splines, see Circle. A ConnectionPatch class is to make connecting lines between two points (possibly in different axes). coordsA and coordsB are strings that indicate the coordinates of xyA and xyB. ‘polar’ you can specify theta, r for the annotation, even in cartesian plots. Note that if you are using a polar axes, you do not need to specify polar for the coordinate system since that is the native “data” coordinate system. Return annotation_clip attribute. See set_annotation_clip() for the meaning of return values. ConnectionStyle is a container class which defines several connectionstyle classes, which is used to create a path between two points. These are mainly used with FancyArrowPatch. and it returns a Path instance. posA and posB are tuples of x,y coordinates of the two points to be connected. patchA (or patchB) is given, the returned path is clipped so that it start (or end) from the boundary of the patch. The path is further shrunk by shrinkA (or shrinkB) which is given in points. Creates a picewise continuous quadratic bezier path between two points. The path has a one passing-through point placed at the intersecting point of two lines which crosses the start (or end) point and has a angle of angleA (or angleB). The connecting edges are rounded with rad. Creates a simple quadratic bezier curve between two points. The middle control points is placed at the intersecting point of two lines which crosses the start (or end) point and has a angle of angleA (or angleB). Creates a picewise continuous quadratic bezier path between two points. The path can have two passing-through points, a point placed at the distance of armA and angle of angleA from point A, another point with respect to point B. The edges are rounded with rad. Creates a simple quadratic bezier curve between two points. The curve is created so that the middle contol points (C1) is located at the same distance from the start (C0) and end points(C2) and the distance of the C1 to the line connecting C0-C2 is rad times the distance of C0-C2. rad curvature of the curve. A line with angle between A and B with armA and armB. One of the arm is extend so that they are connected in a right angle. The length of armA is determined by (armA + fraction x AB distance). Same for armB. will be added to armA and armB. Like Arrow, but lets you set head width and head height independently. True if head is to be counted in calculating the length. fraction that the arrow is swept back (0 overhang means triangular shape). Can be negative or greater than one. if True, the head starts being drawn at coordinate 0 instead of ending at coordinate 0. A fancy arrow patch. It draws an arrow using the :class:ArrowStyle. If posA and posB is given, a path connecting two point are created according to the connectionstyle. The path will be clipped with patchA and patchB and further shirnked by shrinkA and shrinkB. An arrow is drawn along this resulting path using the arrowstyle parameter. If path provided, an arrow is drawn along this path and patchA, patchB, shrinkA, and shrinkB are ignored. The connectionstyle describes how posA and posB are connected. It can be an instance of the ConnectionStyle class (matplotlib.patches.ConnectionStlye) or a string of the connectionstyle name, with optional comma-separated attributes. 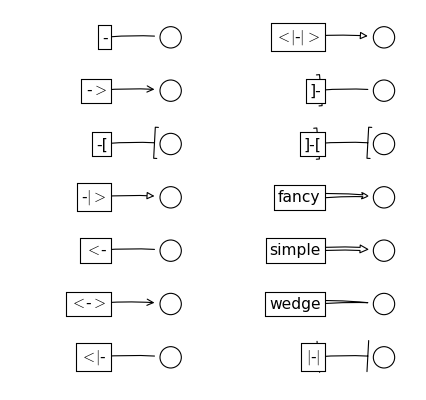 The following connection styles are available. The arrowstyle describes how the fancy arrow will be drawn. It can be string of the available arrowstyle names, with optional comma-separated attributes, or one of the ArrowStyle instance. The optional attributes are meant to be scaled with the mutation_scale. 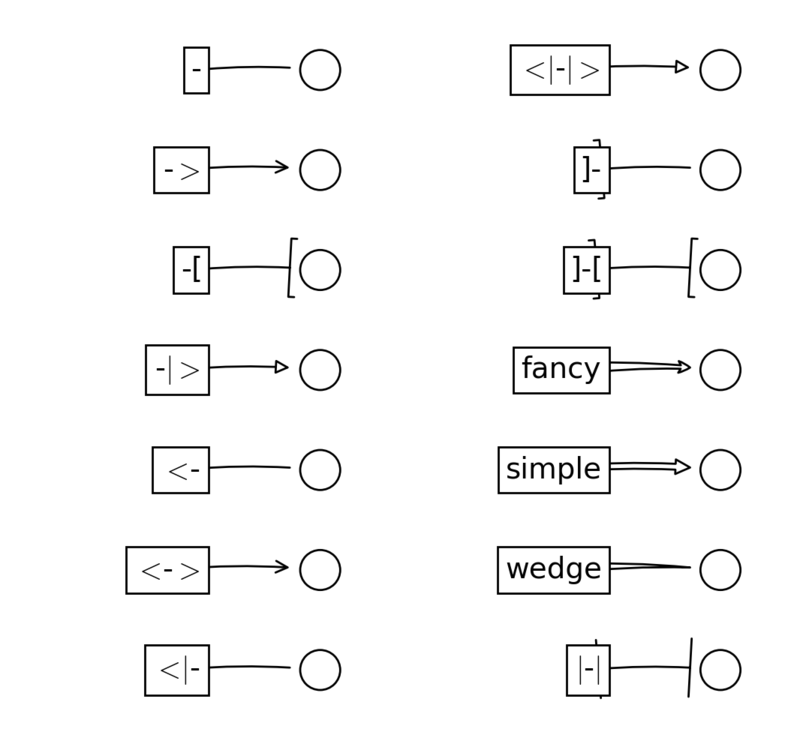 The following arrow styles are available. (e.g., head_length) will be scaled. default=1. squeezed by this value before the mutation and the mutated box will be stretched by the inverse of it. default=None. dpi_cor is currently used for linewidth-related things and shink factor. Mutation scale is not affected by this. Return the aspect ratio of the bbox mutation. return the path of the arrow in the data coordinate. Use get_path_in_displaycoord() method to retrieve the arrow path in the display coord. comma-separated attributes. Alternatively, the attrs can be provided as keywords. Old attrs simply are forgotten. Without argument (or with arrowstyle=None), return available box styles as a list of strings. optional comma-separated attributes. Alternatively, the attrs can be probided as keywords. Without argument (or with connectionstyle=None), return available styles as a list of strings. Set the aspect ratio of the bbox mutation. set the begin end end positions of the connecting path. Use current vlaue if None. Draw a fancy box around a rectangle with lower left at xy*=(*x, y) with specified width and height. FancyBboxPatch class is similar to Rectangle class, but it draws a fancy box around the rectangle. The transformation of the rectangle box to the fancy box is delegated to the BoxTransmuterBase and its derived classes. boxstyle determines what kind of fancy box will be drawn. It can be a string of the style name with a comma separated attribute, or an instance of BoxStyle. Following box styles are available. mutation_scale : a value with which attributes of boxstyle (e.g., pad) will be scaled. default=1. mutation_aspect : The height of the rectangle will be squeezed by this value before the mutation and the mutated box will be stretched by the inverse of it. default=None. Without argument (or with boxstyle = None), it returns available box styles. A patch is a 2D artist with a face color and an edge color. If any of edgecolor, facecolor, linewidth, or antialiased are None, they default to their rc params setting. Test whether the mouse event occurred in the patch. Returns True if the given point is inside the path (transformed with its transform attribute). Draw the Patch to the given renderer. Returns True if the Patch is to be drawn with antialiasing. Return the Transform instance which maps data coordinates to physical coordinates. Return the edge color of the Patch. Return a Bbox object defining the axis-aligned extents of the Patch. Return the face color of the Patch. Return the line width in points. Return the Transform applied to the Patch. If the patch contains Bezier curves, the curves will be interpolated by line segments. To access the curves as curves, use get_path(). Set the alpha tranparency of the patch. Set both the edgecolor and the facecolor. Letters can be combined, in which case all the specified hatchings are done. If same letter repeats, it increases the density of hatching of that pattern. Hatching is supported in the PostScript, PDF, SVG and Agg backends only. Updates this Patch from the properties of other. A general polycurve path patch. path is a matplotlib.path.Path object. xy is a numpy array with shape Nx2. If closed is True, the polygon will be closed so the starting and ending points are the same. The coordinates of the vertices as a Nx2 ndarray. The coordinates of the vertices as a Nx2 ndarray or iterable of pairs. Set/get the vertices of the polygon. This property is provided for backward compatibility with matplotlib 0.91.x only. New code should use get_xy() and set_xy() instead. Draw a rectangle with lower left at xy = (x, y) with specified width and height. A length 2 tuple (x, y) of the center. The distance from the center to each of the vertices. rotates the polygon (in radians). Create a shadow of the given patch offset by ox, oy. props, if not None, is a patch property update dictionary. If None, the shadow will have have the same color as the face, but darkened. Draw a wedge centered at x, y center with radius r that sweeps theta1 to theta2 (in degrees). If width is given, then a partial wedge is drawn from inner radius r - width to outer radius r.
This is an arrow that is defined in display space and has a tip at x1, y1 and a base at x2, y2. For line segment defined by (x1, y1) and (x2, y2) return the points on the line that is perpendicular to the line and intersects (x2, y2) and the distance from (x2, y2) of the returned points is k.
This is a debug function to draw a rectangle around the bounding box returned by get_window_extent() of an artist, to test whether the artist is returning the correct bbox. props is a dict of rectangle props with the additional property ‘pad’ that sets the padding around the bbox in points.